Glazier turned public speaker. 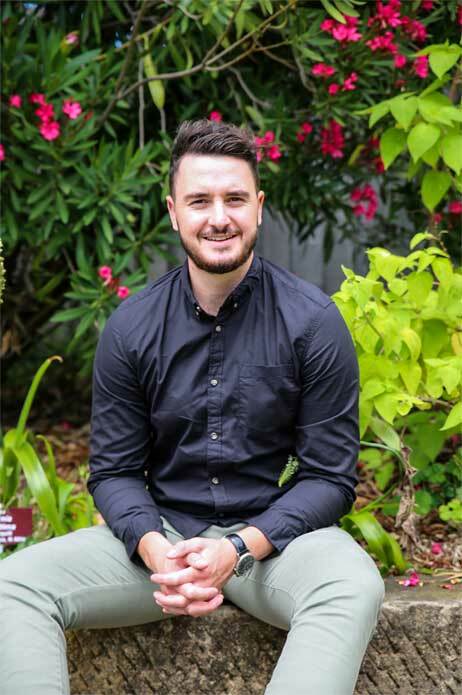 Sharing his lived experience in a bid to change the way Australians view mental health and suicide. Few people have the drive and dedication of Mitch McPherson. 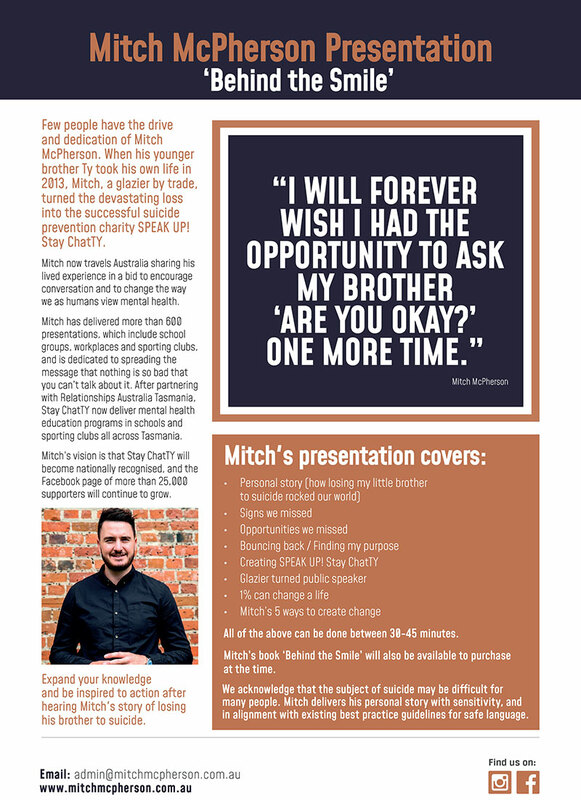 When his younger brother Ty took his own life in 2013, Mitch, a glazier by trade, turned the devastating loss into the successful suicide prevention charity SPEAK UP! Stay ChatTY. 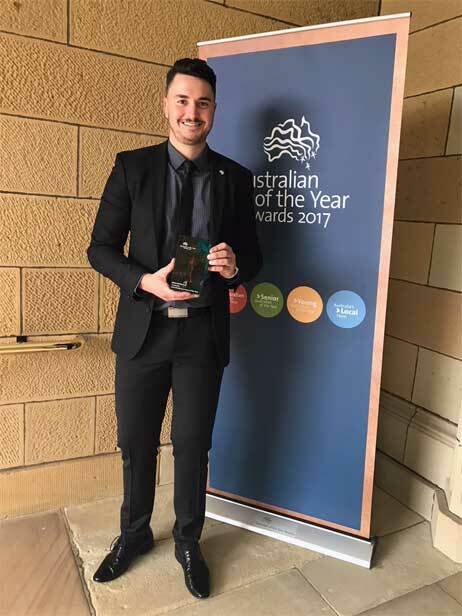 Since then, Mitch the 2017 Tasmanian Young Australian of the Year, has spoken to over 600 events which include school groups, workplaces and sporting clubs and is dedicated to spreading the message that nothing is so bad that you can’t talk about it. Through partnering with key community groups, businesses and sporting identities SPEAK UP! Stay ChatTY has over 24,500 likes on its Facebook page, and this support continues to grow daily. Mitch’s vision is that SPEAK UP! Stay ChatTY will become a national charity, with a focus on delivering programs in schools and sporting clubs around Australia to increase awareness and remove the stigma surrounding mental health. Expand your knowledge and be inspired to action after hearing Mitch’s story of losing his brother to suicide. All of the above can be delivered in 30-45 minutes. Mitch’s book ‘Behind the Smile’ will also be available to purchase at the time. We acknowledge that the subject of suicide may be difficult for many people. Mitch delivers his personal story with sensitivity, and in alignment with existing best practice guidelines for safe language. 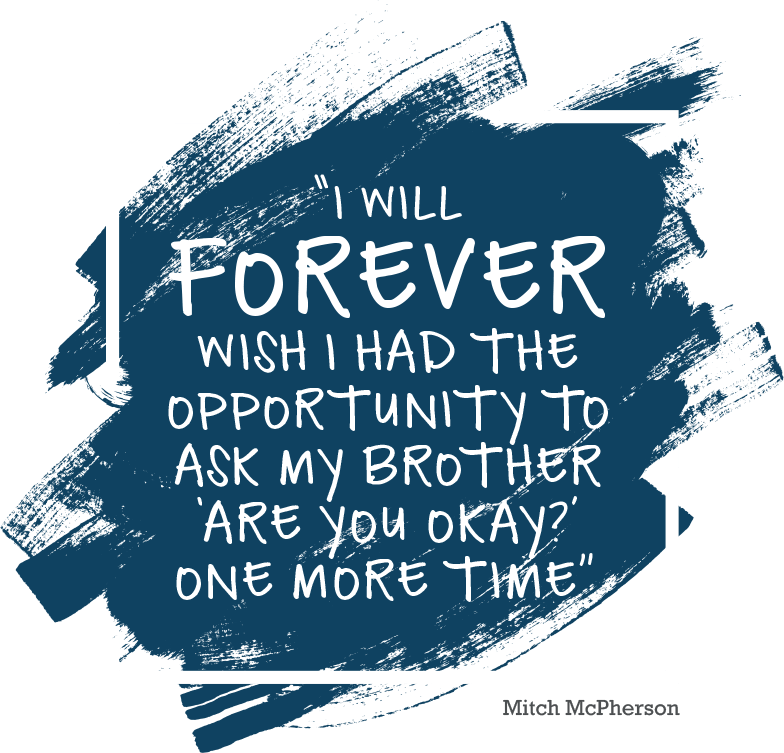 After the loss of his younger brother Ty to suicide, Mitch McPherson founded SPEAK UP! Stay ChatTY. It started humbly with a bumper sticker to keep Ty’s name alive, and turned into a successful initiative raising awareness of suicide and changing the way people view mental health. 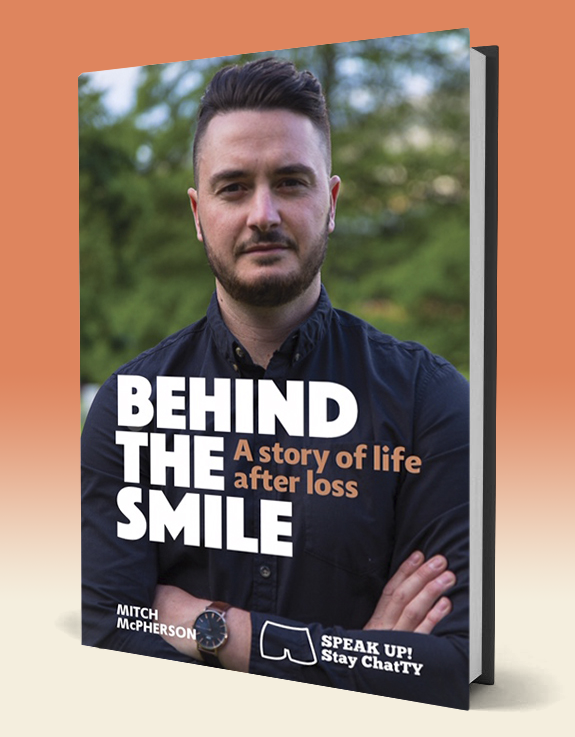 Mitch tells the moving story of his brother’s life and death to help others recognise warning signs that there may be a struggle behind someone’s smile. He speaks plainly and simply, connecting to those who need to hear these messages – the young, sportspeople, tradies and more. It’s a powerful book to read, and Mitch’s experience shows us all the importance of looking out for those around us. It might even save the life of someone you love. For bookings or enquiries please submit the form to the right, or email us directly at admin@mitchmcpherson.com.au.